For most people working in a corporate or office environment casual Friday, also known as dress-down Friday, comes as a welcome reprieve from strict business attire. But as anyone who has watched the casual Friday episode of the US version of The Office will know, it can mean many things to many people and can so easily go badly wrong. So what are the options and what are the do’s and don’ts to avoid a career defining moment? Unfortunately, there is no one-size-fits-all solution. 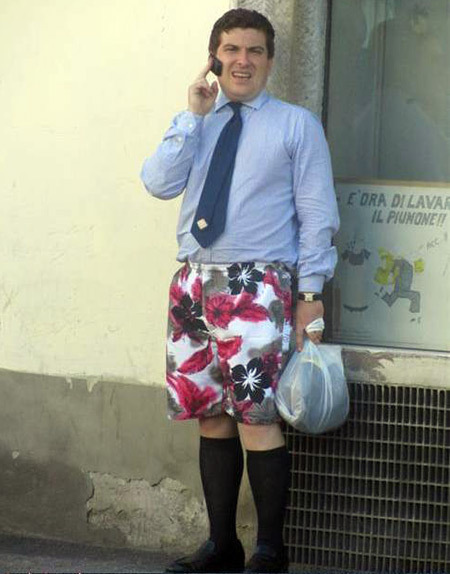 After all, the whole point of casual Friday is that it offers more freedom to express your individual style. It also depends largely on the industry or profession you work in and the culture of your specific workplace. To maintain a degree of professionalism, many companies’ HR departments have drafted policy guidelines on what is and isn’t acceptable, but here are some pretty obvious no-no’s. Keep the beachwear (thongs, shorts, crew neck Tshirts and singlets) for the weekend. Also avoid runners and any kind of sports gear – though you might just get away with wearing team colours on the eve of a Grand Final weekend! As a general rule of thumb, if you choose casual for your top half, keep it a bit smarter below the belt. Alternatively, if you decide to keep it strictly business above the belt, relax a little with the pants. So, one option is to mix ‘n match a more formal business shirt with a pair of jeans – particularly on jeans for genes day. But make sure the jeans are smart – avoid too skinny or too baggy and leave the old torn-at-the knees jeans for the weekend. Geoffrey Beene and Nicholby & Harvard make a great range of 100% cotton business shirts in sizes ranging from 46 to 56. For jeans, choose between Chisel, Blazer, Gant and RM Williams. And if you want the ultimate in comfort, you can’t look past Brax and Eurex. 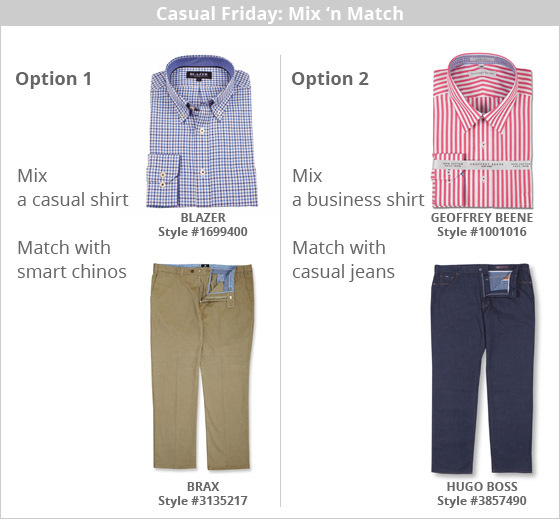 Another mix ‘n match option is to wear a more casual shirt with a pair of cotton chinos or even more formal dress pants. If this is your chosen option, best to stick with long sleeve shirts rather than short sleeve, even if it means rolling the sleeves up on warmer days. Generally speaking, you should choose a slightly more classic fitting casual shirt. Blazer and Gant offer some great casual shirts for big & tall men. But if you need the room, RM Williams and Nautica will provide a more relaxed fit. Of course the really big question when wearing a casual shirt, quite often foremost in the minds of bigger men: tail tucked in or left out? This really takes us back to the type of industry you are in and the company culture. If in doubt, take it to the TMO – ask your wife or partner. In cooler months, a fine wool V neck sweater or vest and/or a smart sports jacket will work equally as well with all these options. Regardless of which casual Friday outfit you choose, don’t ruin it with the wrong choice of shoes. RM Williams boots are a perennial favourite in Australia, but otherwise any smart pair of leather or even suede shoes will work. But, I thought you said ‘boardie meeting’! ← Are you a big man?